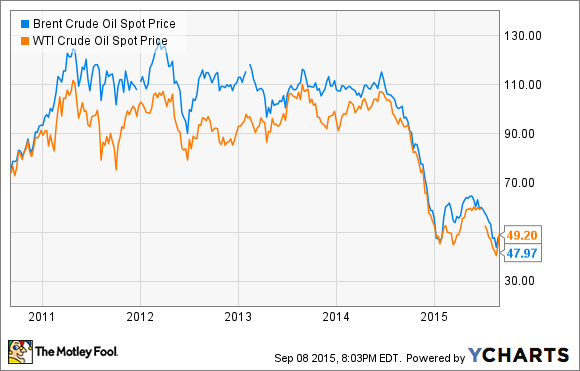 While cheap oil is bad for big oil, its a boon for major consumers oil. The days of triple-digit oil prices are clearly in the rearview mirror, with some suggesting it could be years before oil ever tops that mark again. While that's bad news for OPEC and big oil, it's music to the ears of those that consume oil and petroleum-based products. 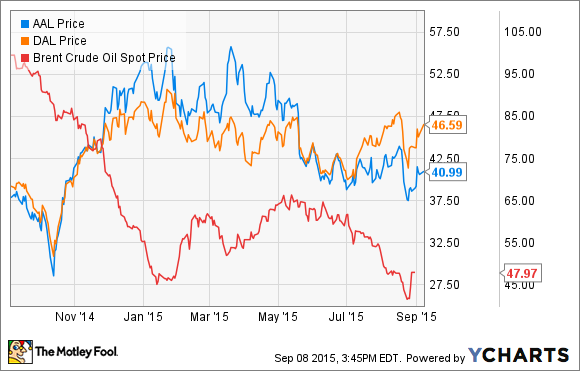 Here are three industries really cashing in on the low price of crude. John Rosevear: Nothing makes an auto investor happier than a maxed-out factory making high-profit products, and Ford (NYSE:F) and General Motors (NYSE:GM) both have a bunch of those right now thanks to a boom in SUV and truck sales that has been fueled in part by lower gas prices. The tremendously high costs of an auto factory mean most don't break even until they're running at about 80% of capacity, generally speaking (where "capacity" is two full shifts, five days a week). A factory that is running flat-out, nearly around the clock, is at its most profitable. If it's making high-profit-margin products like pickups or SUVs, that's even better. Demand for big GM SUVs like this GMC Yukon Denali has so far outstripped supply that GM is spending over a billion dollars to expand the Texas factory that makes the big trucks. Source: General Motors. Both Ford and GM are running their pickup plants close to flat-out right now. Both have several SUV factories running at or near full speed: The factories making Ford's Escape and Explorer and GM's full-size SUVs are said to be just about maxed out. Demand for GM's biggest SUVs is so strong that the company is investing $1.4 billion in a major expansion of the Arlington, Texas, factory that makes them. A maxed-out auto factory presents a conundrum: Invest big in an additional production line that may be idled when demand wanes, or stay pat and give up incremental sales gains in the meantime? Either way, it's a very profitable conundrum while it lasts. Both automakers reported exceptionally strong profits in North America in the second quarter, with a 11.1% operating margin at Ford, and a 10.5% margin at GM. Those are outstanding margins for mass-market automakers. As long as the U.S. economy remains healthy and gas remains cheap, demand for these products should continue to be very strong -- and Ford and GM shareholders should reap the gains over time. Jason Hall: Oil prices have rallied over the past few weeks, but it's way too early to call this a recovery. Oil prices could stay at depressed levels for a lot longer, and for several reasons, including too much global supply, slow growth in demand, and potentially more sources coming online, including Iran's additional production once sanctions are lifted. Yes, the spread has narrowed recently, but oil refining remains very profitable, and Phillips 66 has been using the huge free cash produced by its refining business to grow its midstream business of operating fee-based transportation of oil, natural gas, and distillates around the U.S. In other words, even as commodity prices fall, demand remains high, and Phillips 66's business is built to profit from the demand. Matt DiLallo: Warren Buffett once quipped that, "Investors have poured their money into airlines and airline manufacturers for 100 years with terrible results," and that, "It's been a death trap for investors." His disdain for airlines alone is reason enough for many investors to avoid the industry. However, there is a case to be made that the industry's recent consolidation plus the big plunge in oil prices could send airline profits soaring over the next year. As the chart below suggests, there is some correlation between the price of oil and the stock prices of major airlines. When oil plunged late last year, it fueled a subsequent rally in airline stocks, as these companies really benefit from the fact that cheaper crude lead to lower jet fuel costs. For example, fuel and related costs are American Airlines' (NASDAQ:AAL) highest operating costs, and at one time, they represented 25% of its revenue. In fact, the company estimated that the drop in the price of jet fuel has the potential to save the company $5 billion over the next year, which, for perspective, is more than double its operating income in the prior year. Delta (NYSE:DAL) likewise benefits from lower crude prices not just on the airline side, but at its refinery, too. Refining profits are so strong at the moment that the company is running its Trainer facility at 110% of its nameplate capacity in order to soak up and process as much cheap oil as it can. The company is already on pace to exceed its profit goal to earn $300 million this year at the facility, having booked $176 million in profits through the first half of the year. Continuing low oil prices will enable airlines to reap some pretty big profits, and that catalyst should lead to soaring stock prices -- at least until the airlines figure out a way to prove Buffett correct once again.